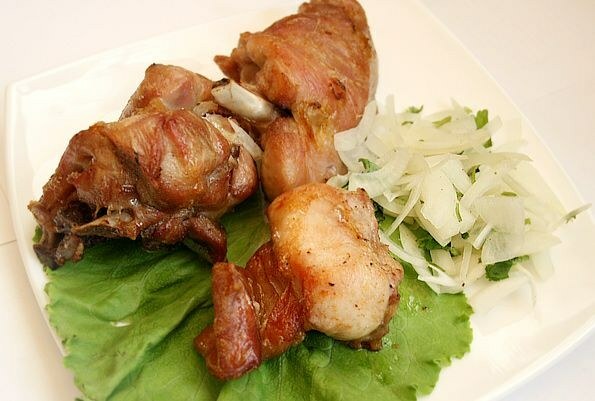 Rabbit meat some people mistakenly believe are unsuitable for grilling, because it is delicious and tender too. However, this statement is fundamentally wrong, because properly cooked rabbit is able to introduce novelty into the usual summer gatherings with a barbecue. It is worth mentioning that the skewers of rabbit even shown some people, because the meat of this animal differs from the same pork that it practically has no cholesterol, lots of calories, various vitamins, minerals and plenty of useful protein. For portions for 2-3 people you will need: a rabbit, 2 onions, Bay leaf, vinegar (70%), 150-200 ml of water, salt, black pepper and other spices, seasonings and herbs to taste. Before marinating and roasting a rabbit you need to properly cut. It is first carefully washed the carcass should be cut into 5-6 pieces – 4 legs and 2 pieces of the main carcass. Of course, it is possible to cut arbitrarily, but if you are going to cook on the skewers, make sure that the pieces of rabbit meat did not slide off. But if you plan to use barbecue grills – cut as anything. Now pre-cut the carcass should be placed in a deep container and then begin marinating. For the delicate rabbit meat, except for vinegar, suit such options – marinating in white wine, whey or olive oil with garlic. The first traditional option you need to fill up the rabbit meat, finely chopped onions, which will actively give juice, pour in a container of vinegar, to add salt and spices. In the latter respect, it is possible to navigate, consistent with their own preferences, but the most suitable for rabbit, but black pepper is considered the juniper berries (which adds tartness), lemon, cinnamon, cloves and coriander. Then you pour in a container of water so she literally 0.5 cm covered meat, and leave the rabbit to marinate for 3-4 hours. This time will be enough for such a delicate meat, in contrast to pork or lamb. After that, if you are an experienced person in terms of barbecue, fry the rabbit meat ordinary way – over coals from burnt firewood (best suited birch). Fried rabbit literally 8-10 minutes on a hot grill, but don't forget to baste it with marinade as it will make the meat more juicy. Serve ready rabbit is best a small "slide" of the pieces, surrounded by leaves of green salad, fresh vegetables or sprinkled with herbs. This dish is insanely delicious and will delight you and your guests!